In part 2 of her memories of Tarun Bose, his daughter Shilpi shares this about a film I really love! ‘Silence is Golden’ is an oft-repeated phrase which has relevance not only in real life but also in reel life—particularly in those ‘edge of the seat’ suspense thrillers-murder mysteries. I always felt that silence followed by sudden background music—usually the crash of drums—makes a huge impact in a suspense film, particularly within the close confines and darkness of a cinema hall. Every time I watched such a scene, my heart beating expectantly I couldn’t help but notice the nervous coughs and giggles in the cinema hall. Alfred Hitchcock was a master at using silence—his film ‘The Man Who Knew Too Much’ is a case in point. Tarun Bose is one of the treasures of Hindi cinema history. 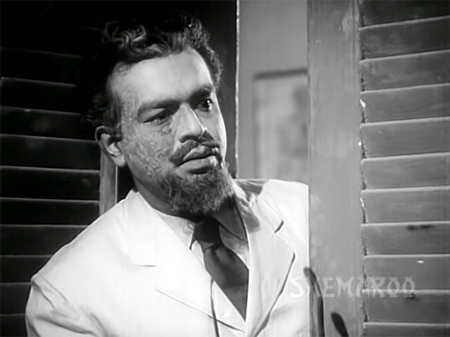 He is one of those consummate actors who could and did “disappear” into his roles, making it difficult if not impossible sometimes for a fan to identify him as “Tarun Bose.” He was taken from us and from his loved ones by a heart attack—far too soon and far too young—in 1974, but was a key player in many memorable films before that. 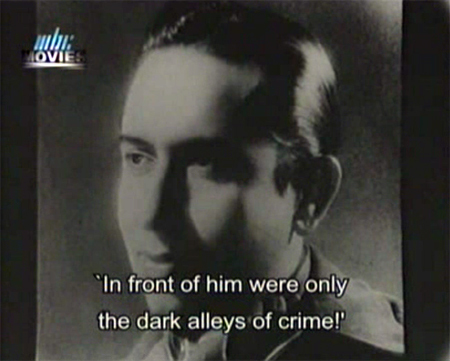 The above screen shot is of his first appearance onscreen, about three minutes into his 1957 debut film Apradhi Kaun. Many of you know that his daughter Shilpi has been sharing anecdotes about him for some time here. I asked her if she would be willing to write a guest post about him, and she has generously offered to share much more about his life and work and her memories of him than will fit in one post. I am thrilled! I know that regular readers of this blog will appreciate this rare glimpse into a wonderful actor and even more wonderful man. When she gets her scanner up and running again she may share photographs too, so let’s encourage her to keep going. Thanks so much, Shilpi—and over to you! This might be the cutest version of “Tequila” you will ever see. Geeta Bali at her most adorable, with my pal Ted Lyons providing backup. Thanks to Tom for putting it up! It’s from Jab Se Tumhen Dekha Hai, review coming up soon! One of my dad’s favorite boyhood films was 1935’s Captain Blood with Errol Flynn and Olivia DeHavilland. I never knew that until a couple of years ago, but in the meantime it had become one of my favorites too. I love a good pirate movie! 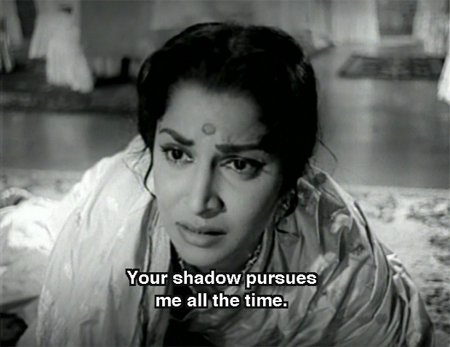 Guru Dutt’s film Baaz was an early favorite when I began watching Hindi films, especially since the pirate in question was a girl, and Geeta Bali at that. 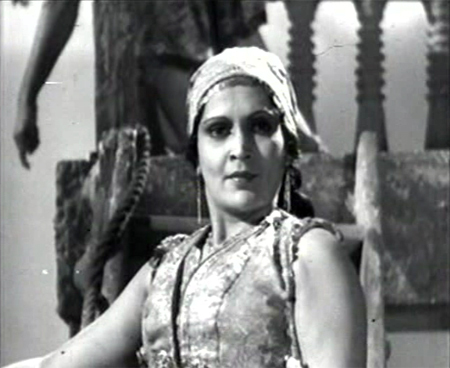 So imagine my joy when I discovered that around the time Errol Flynn was making Captain Blood, Prabhat’s own V. Shantaram was making a film starring the statuesque and beautiful Durga Khote as Pirate Queen Saudamini. Imagine! And furthermore, my beloved Chandramohan—he of the startling green eyes and overpowering charisma—is in it too! Tags: B Nandrekar, Chandramohan, Durga Khote, Hindi pirate film, K Narain Kale, Karunadevi, Prabhat Films, Shanta Apte, V Shantaram, Vasanti, Why is this not subtitled why?! Hackneyed fairy-tale featuring a lost prince returning home? Check. 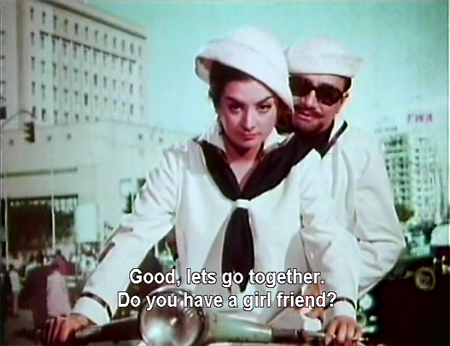 Shrill Saira Banu opposite preternaturally youthful Dev Anand? Check. 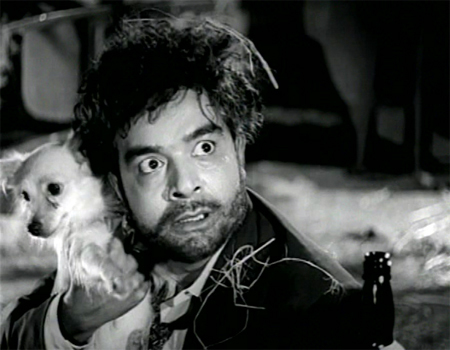 Portly Premnath as an evil Senapati? Check again. Did I like the film? Oh hell yes! What’s not to love about a movie that advertises a cast of “about 500 Indian & International junior Artistes” and delivers on that promise? Who cares if the plot is silly? Not I, given a frothy sixties travelogue with ports of call in a Middle East populated by blonde belly dancers and stoned hippie extras. I love to see my people in Hindi movies. 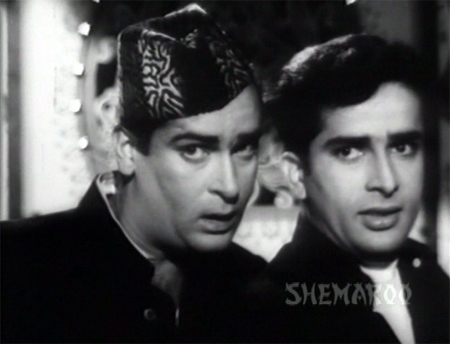 Plus, Shankar Jaikishan provide some seriously catchy tunes to accompany all the onscreen antics. Tagged by Banno, a dear friend to whom I cannot say no, I have been asked to elucidate ten ways in which my behavior or desires is not generally reflective of my female gender. This is a much murkier area than it would have been, say, twenty years ago (at least here in Amrika) but it’s still a pretty easy list for me to make. I love being a woman, but I have often rebelled against what women are “supposed to do.” At dinner parties you will find me hanging out with the men and drinking beer, for instance, not helping in the kitchen. 1. I have no maternal instinct. This complete and utter lack of any wish to have a rug rat running around underfoot has also prevented me from getting married (men are like children, no? )…I can take care of myself, but that’s about it. I really don’t want to take care of anyone else. Gemma mostly keeps herself alive by reminding me vociferously to feed and walk her, but she would tell you that it’s not easy to get my attention. 2. I am fiercely independent. I might need your help but I will never ask for it, and much of the time won’t take it when it’s offered freely either. This is not a good or healthy thing, and I am working on it, but it’s still there. I do ask for directions when I’m lost, however. I’m independent, not stupid.